Let's start the week with a new pattern by none other, An from Straight Grain. This woman is amazing, but I'm sure you already knew that! I just love her approach to little girls' clothing... simple and feminine. It's refreshing to see her timeless designs in an otherwise trendy world of fashion. 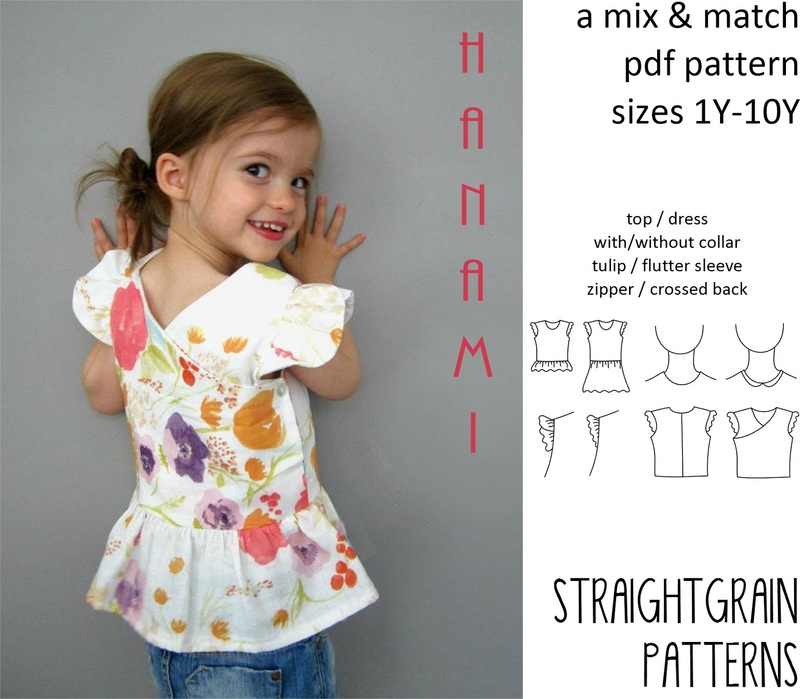 So when An asked for pattern testers for the Hanami pattern, I pounced on the chance! I mean look at this pattern... how adorbs is this?! The pattern has the option of a dress or top, crossed back or zipper, collar or no collar and ruffle sleeve or tulip flutter sleeves. I opted for crossed back top with tulip flutter sleeves. Crazy options, ay? I sewn up a size 3Y which is equivalent to a 3T here in the US. Isn't the back darling? This is what got me hooked. If I was to see this on a hanger, my first thoughts would be the back being the front and I honestly would've thought nothing more of it, but it's not. Now, I have a little secret. I know-I know... it sounds ridiculous and especially coming from someone who has sewn for such a long time, but I just don't care for it. I'm a bit intimidated by it actually but if my buttonhole maker keeps misbehaving, I just might give in and start sewing zippers. I added contrasting fabric to the sleeve lining... a cute little surprise! The fabric is the Briar Rose collection by Heather Ross (loooove!) and the buttons are from a local fabric shop (they have a big chest full of buttons). Now here's what I did differently. I made the top into a wrap versus a pull over with snaps on the inside. The reason I did this was because Lala is... how should I say... slightly above average in the weight category, so when I initially made this into a pullover and tried to put it on, it was anything but easy. I am loving this change. LOVE-LOVE-LOVE! 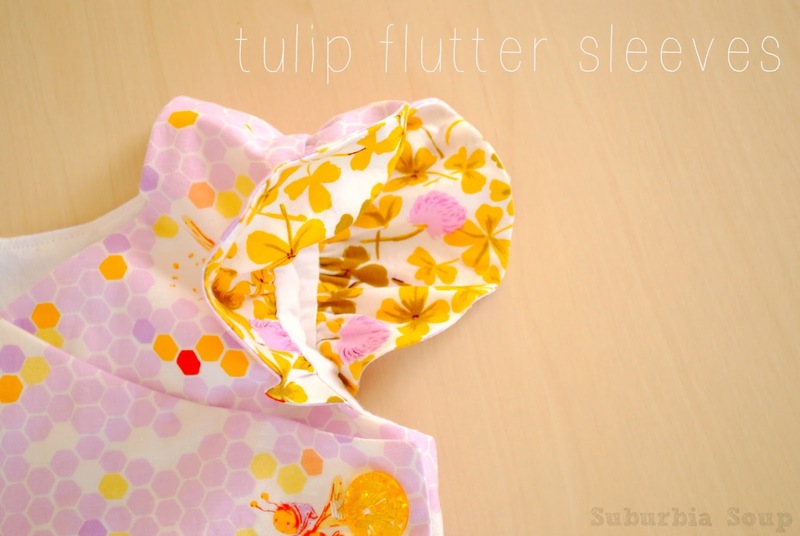 And with the overlapping of the ruffled flounce just adds to the cuteness factor. The top took less than a day to make and An's step by step instructions along with great photos made the whole sewing experience a pleasant one. You could probably get by just by looking at the photos! Overall, this pattern is an A+ in my book. Easy to follow instructions, great photos, a plethora of style options and a classic design... how can you go wrong? Check it out for yourself! The pattern is available HERE. If you're still not convinced, check out all the other bloggers who tried the pattern starting today and throughout the week. You too will soon agree that the Hanami pattern is 'ichiban'!!! What a gorgeous top! 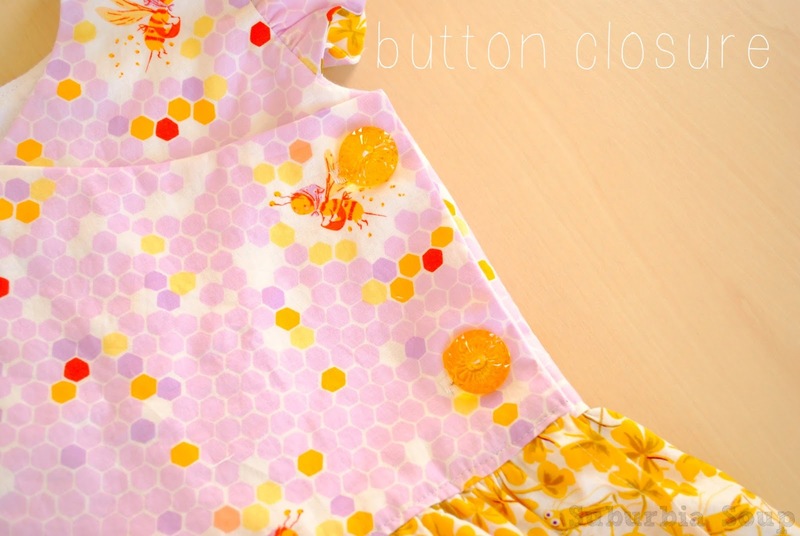 I thought about the same solution for my daughter's Hanami dress (as she's slightly above the average in her weight category as well) but in the end I just moved the buttons. But I might turn my next version in a wrap as well now. Love the fabric! love it! I was a tester, too. The pattern is superb! I sewed the zip version and it fits a little snug on E, too. Will have to try the crossed back! Awww.. 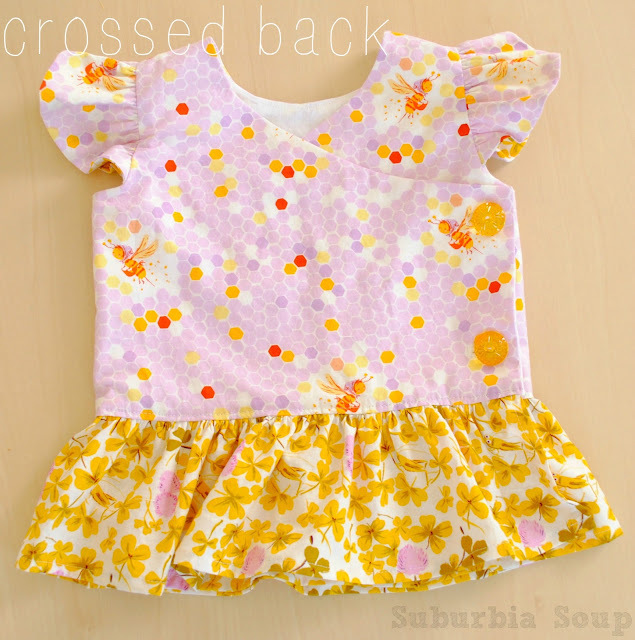 Crossed back is superb cute;) I really want to try this pattern.. And love the combination of Briar Rose fabric and honey colored buttons!! Love it. I tested too and went for the crossed back becasuse of zipper phobia ;-) Love the wrap alteration. 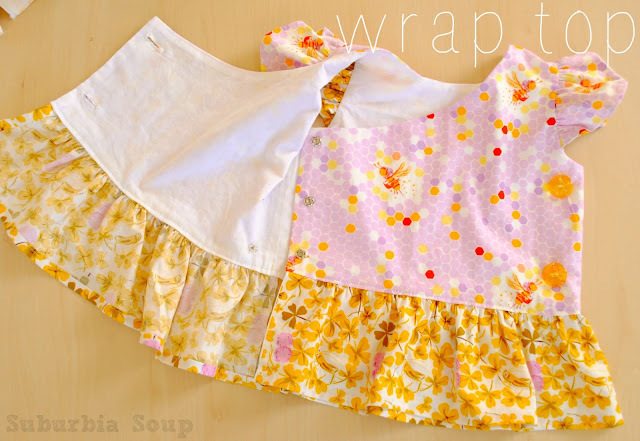 Love the wrap alteration - might try that next :) The briar rose fabric is gorgeous and the buttons look like yummy sweets - too cute! ahhhh it's perfect! the fabric, the buttons, the cute sleeves and crossover back, i love it all. now, what is wrong with your buttonhole maker, and how are you not a zipper expert?! and, lala is perfectly proportioned, if you ask me. Gorgeous Venus - a good idea to make it open at the bottom for little tummies!! This is soooo pretty! The fabrics of choice are gorgeous! Such a happy shirt for a happy girl! When I saw the briar rose honeycomb print before, I could hardly imagine it becoming the perfect summer shirt. I love the contrasting print hiding inside the sleeves! I love the fabric combination you chose! I also made the crossed back version and though about making the same change you made but ended up sewing it the original way. Next time I will definitely give it a try! love love love! 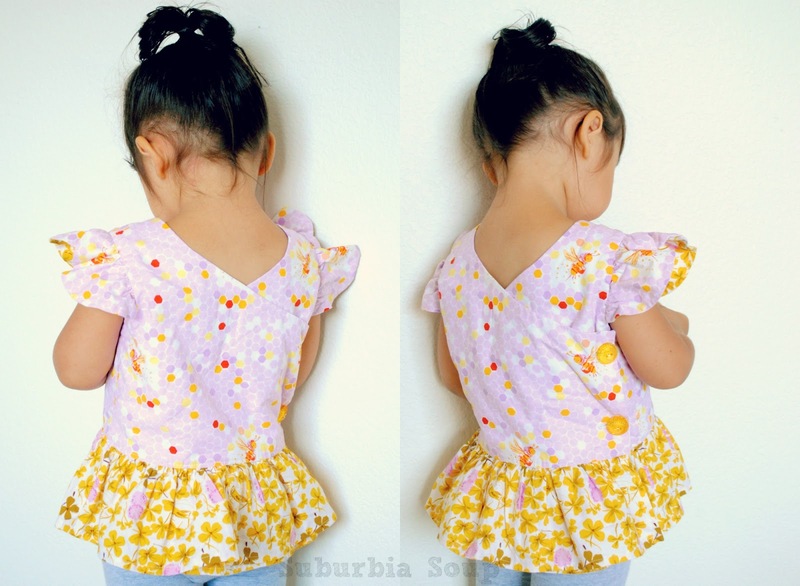 And I actually think it looks even better with the buttons :-) Such a cutie top for a cutie girl! I adore the fabrics you have used, especially the contrasting lining to the sleeves. Great idea about making the top open right our at the back too. I love the Hanami pattern and briar rose. What a perfect combination! I love your top. Lovely fabric and ... with buttons is really fun! I wouldn't say you don't do zippers! But the wrap style is really nice!